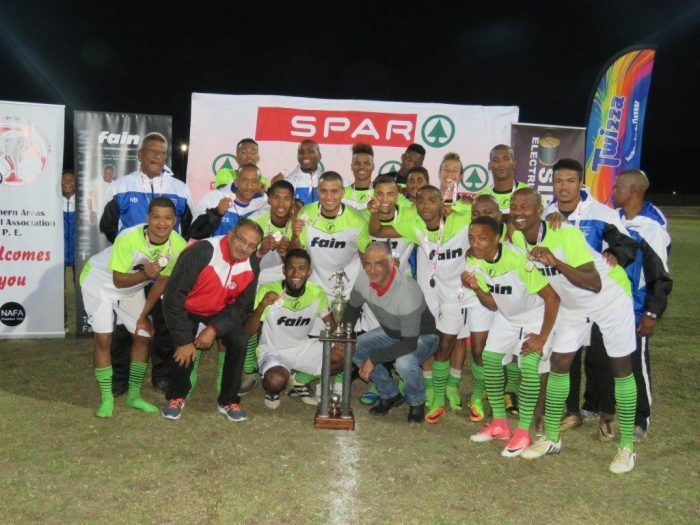 Tournament director Valentine Brink has called the 44th SPAR Northern Areas Easter soccer tournament a massive success and said they were looking forward to an even better event next year. Brink has been involved in the Easter tournament since its inception in 1973 and said the festival of soccer continued to grow from strength to strength. “Even though there was some rain on Friday, thanks to the support of our sponsors, the whole weekend went off very well and we are excited as we look ahead to even bigger things next year,” said Brink. He felt one of the features which had made a significant difference was the decision to include an invitation team, Sibanye, who eventually pocketed the title. Made up of players from the ABC Motsepe and SAB Leagues and representing one of the sponsors of the tournament, Sibanye Electrical, they defeated Park United 5-3 on penalties in the final after a 1-1 score at the end of extra time. Brink said the Sibanye team had lifted the playing standard at the tournament, resulting in the teams all raising the level of their play. “It was good to have these sorts of players in the tournament and I feel it is definitely an idea to pursue for the future. “None of the teams were disgraced against them and you could see them all working hard to show they could match Sibanye. “This was proved in the final, with Park United competing all the way and only losing in a penalty shootout. Another important feature of the festival, said Brink, was the age-group divisions. He said there were also age-groups from U11 to U17, while an U20 category, with eight teams participating, was introduced for the first time. SPAR promotions and advertising manager Alan Stapleton said they were pleased to support the tournament for a second year. “From a SPAR perspective, it was great to be involved with a tournament with such a wonderful heritage, which attracted players from a wide spectrum of clubs,” he said. “Besides being well organised, there was plenty of talent on display and a magnificent vibe throughout.